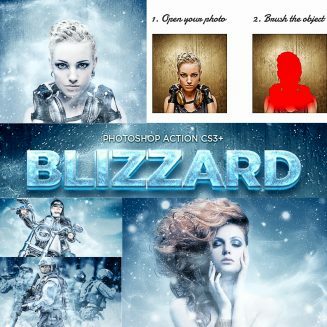 Introducing Blizzar Action for Photoshop. Non destructive effect; Tested and works on pictures with 1000-5000px width images, any resolution; Structurized and editable PSD-file; Different result every time! File format: .atn, .abr for Photoshop or other software. Tags: blizzard, blue, cold, effects, freeze, frost, ice, iceberg, manipulation, photo, photoshop action, photoshop effect, professional, season, seasons, snow, snowflake, storm, style, temperature, tutorial, white, wind.